Hyper Suction is a Special Move in Wario World. When the player presses or while there are loose coins around, Wario opens his mouth wide in a Kirby-esque fashion and collects them by sucking them up. 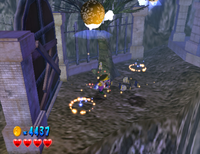 Wario can't attack and moves very slowly while Hyper Suction is being used. In Super Smash Bros. for Nintendo 3DS / Wii U, Wario has a custom special move that is somewhat similar to Hyper Suction, though it is used as an attack and called Inhaling Chomp. ↑ Wario World instruction booklet, page 8. This page was last edited on February 5, 2019, at 16:04.